Egg yolk makes a slimy, yellow mess in your carpeting. The wrong cleaning methods can make the stain even worse. Hot water or other heat sources will cook the protein in the egg yolk, resulting in cooked egg stuck in your carpet fibers. However, with the right stain removal methods and supplies, you can successfully get an egg yolk stain out of your carpet. Egg yolk is a sticky stain in carpeting. Use a spoon to scoop the egg yolk carefully from the carpet. Wipe up as much egg yolk as possible with paper towels. Mix 1 tbsp. of dish detergent with 2 cups of warm water in a bowl. Dampen a clean cloth with the detergent solution. Squeeze out the excess solution. Dab at the egg yolk stain in the carpet to remove remaining stickiness. Rinse the cloth with warm water to remove egg. Apply more detergent solution and continue to remove the sticky egg yolk residue. Moisten a clean cloth with warm water, and blot the carpet to rinse out the soap. Combine 1/4 cup of white vinegar with 1 cup of warm water. 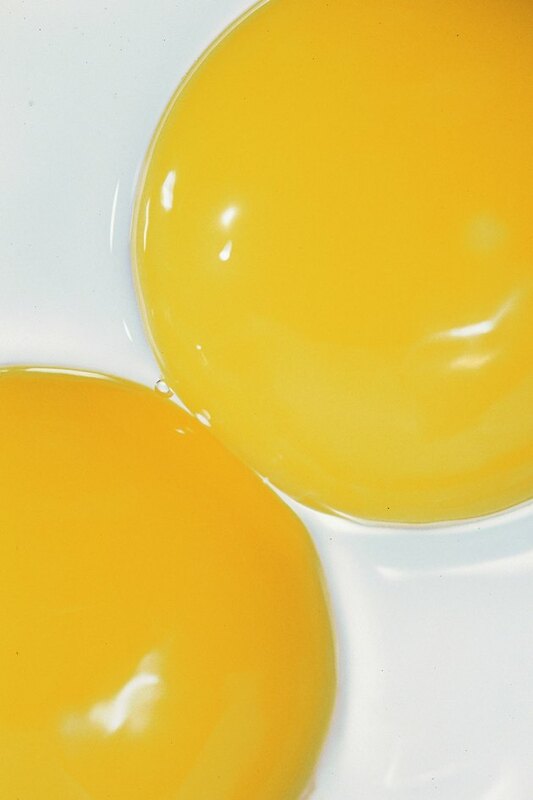 Blot the egg yolk stain with the solution to remove remaining stickiness. Rinse the carpet with a damp cloth. Test hydrogen peroxide on an inconspicuous area of the carpet to ensure it doesn't bleach your carpeting. If there is no color change, treat remaining egg yolk color stain by dabbing at the carpet fibers with a cloth moistened with a mixture of one part hydrogen peroxide and three parts water. Allow the peroxide mixture to remain on the carpet for a few minutes. Blot the peroxide with a dry cloth. Allow the carpet to air-dry completely.